New enhancements to customer relationship management (CRM) systems are driving revolutionary changes in Marketing’s relationship to Sales. 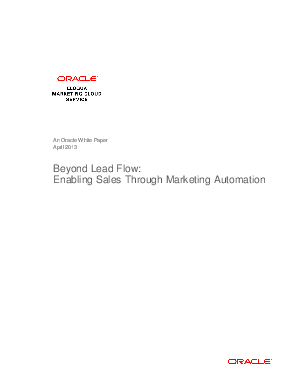 As such, lead flow and lead criteria are only the first of many factors that marketers can take into account to enable their sales teams. In fact, there are five key areas in which marketers can employ marketing automation to deepen their relationship with Sales, including helping Sales understand its prospects, accounts, and territories; helping Sales build trusted relationships; and helping Sales maintain a top-of-mind presence.